99 For the sting of an addar Take a head of garlick and bruise it with some rue add some honey thererto and apply it to the place. 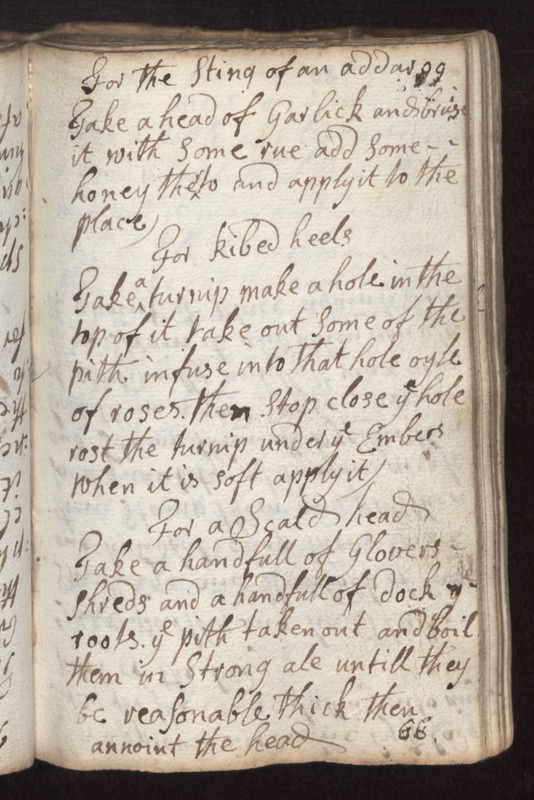 For kibed heels Take a turnip make a hole in the top of it take out some of the pith infuse into that hole oyle of roses then stop close ye hole rost the turnip under ye embers when it is soft apply it. For a Scald Head Take a handfull of Glovers Shreds and a handfull of dock [illegible] tools ye pith taken out and boil them in strong ale untill they be reasonable thick then anoint the head.